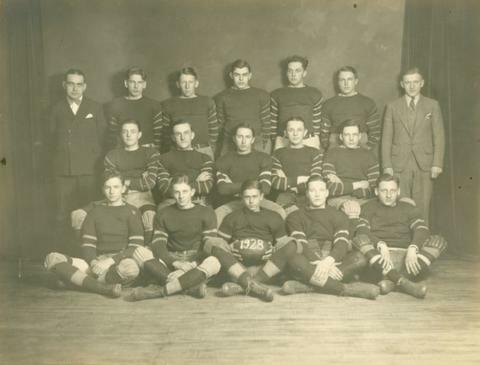 The photograph is of the Sherbrooke High School rugby team in 1928. Pictured in the photograph are: L. O'Donnell, J. Blue, R. Coombs, L. Tomkins, O Charlewood, R. Evans, D. Howards, W. Bradley, B. Howard, E. Wiggett, M. Mariasine, A. Mackay, D. Cross, N. Welsh, R. Newton, S. McHarg, and R. Harper.